ABSTRACT: ‘Our students today are all ‘native speakers’ of the digital language of computers, video games and the Internet’ (Prensky, 2001). Despite its position as a dominant social networking platform globally, research reveals that faculty lag behind students in their inclination to engage Facebook for learning (Junco, 2012). A creative college should be at the forefront of pedagogy and practice and the millennial student cohorts who inhabit our classrooms live connected lives through social media with peer interaction a strong predictor of student persistence and completion (Junco, 2012). 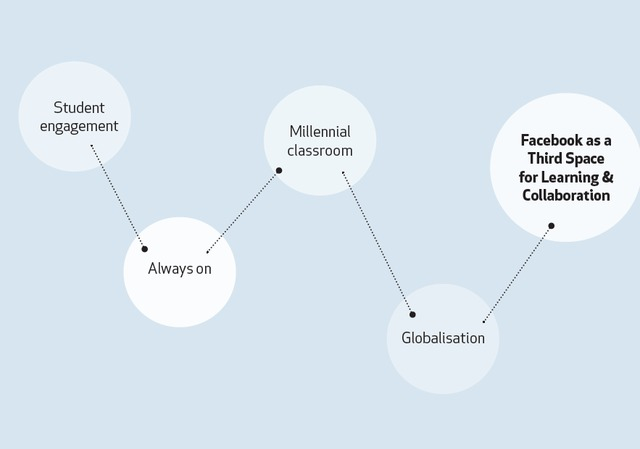 As industries are increasingly globalised, our students’ future workplaces require facility with cross-cultural collaboration, yet curricula often remain situated within the home culture. With creativity a key attribute for young professionals; learning how to learn and harnessing opportunities for independent, intrinsically motivated engagements are vital for students and teachers alike (Collins & Amabile, 1999; Csikszentmihalyi, 1999). This presentation focuses on exploring key themes raised by an exploratory collaborative project using Facebook as a platform to connect London College of Fashion Marketing & Design students with students at City University Hong Kong studying courses in Advertising and Popular Culture. The collaboration took the form of a shared private Facebook group - an International Fashion Panel - where staff and students shared learning resources and current critiques around brand identity, cross-cultural marketing and city branding. The Facebook platform was used both separately and collaboratively to support students’ co-creation of their educational experience e.g. carrying out primary research on the Hong Kong fashion industry. The digitally mediated collaboration allowed for flexibility in when and how education took place, providing a third space for co-creation of learning. Student evaluations, Personal and Professional Development statements and focus group contributions supplement the tutors’ reflections on the process. Benefits of the collaboration included enhanced digital literacies, the facilitation of research in remote markets and the raising of awareness of cross-cultural issues in product design and fashion marketing. In addition students conceived of the experience as a virtual exchange program. An overview of the process, both the opportunities and anxieties, is given drawing on the experiences of the teachers and students involved informing a discussion around the issues inherent in the opening up of the classroom and the relinquishing of teacher control.